Tony Abou-Ganim is widely regarded as one of the pioneering and leading bar professionals in the world. He has made dozens of national TV appearances on shows including TODAY, Iron Chef America, Good Morning America, CNBC, Fox News and more. Abou-Ganim is the author of The Modern Mixologist: Contemporary Classic Cocktails (Agate, 2010) which offers readers an in-depth look into spirits and ingredients available to today’s mixologist, both professional and amateur alike. This entertaining and informative journey will take readers from the early stages of the cocktail to what Abou-Ganim has come to deem “Modern Mixology.” Abou-Ganim also has a DVD to his credit, Modern Mixology: Making Great Cocktails at Home, and hosted the Fine Living program Raising the Bar: America’s Best Bar Chefs. Abou-Ganim has also won three Iron Chef America competitions; pairing cocktails with Iron Chef Mario Batali; with Iron Chef Jose Garces and most recently with challenger Chef Sean McClain. His signature branded line of Modern Mixologist bar tools and his second book, Vodka Distilled (Agate, 2013), are available now at www.modernmixologist.com. Abou-Ganim grew up in the bar business, learning the craft from his cousin Helen David at the Brass Rail Bar in Port Huron, Michigan. His initial introduction to the business was steeped in the tradition of classic cocktails and professional barmanship, teaching him the necessary steps to become a leader in the beverage industry. After graduating from college, Abou-Ganim further developed an appreciation for a hand-crafted cocktail using only the freshest ingredients while working at Jack Slick's Balboa Café and then during the opening of "Harry Denton's,” a legendary hangout in Fog City. In 1993 he moved to New York City and took a position as the opening bartender at Po, Mario Batali’s first restaurant. Tony later returned to San Francisco to open Harry Denton's Starlight Room atop the Sir Francis Drake Hotel and it was here that he developed his first specialty cocktail menu featuring several of his original cocktail recipes including the Sunsplash, Starlight and his most famous of them all, the Cable Car. In 1998, Abou-Ganim was selected by Steve Wynn to develop the cocktail program at Bellagio Las Vegas. 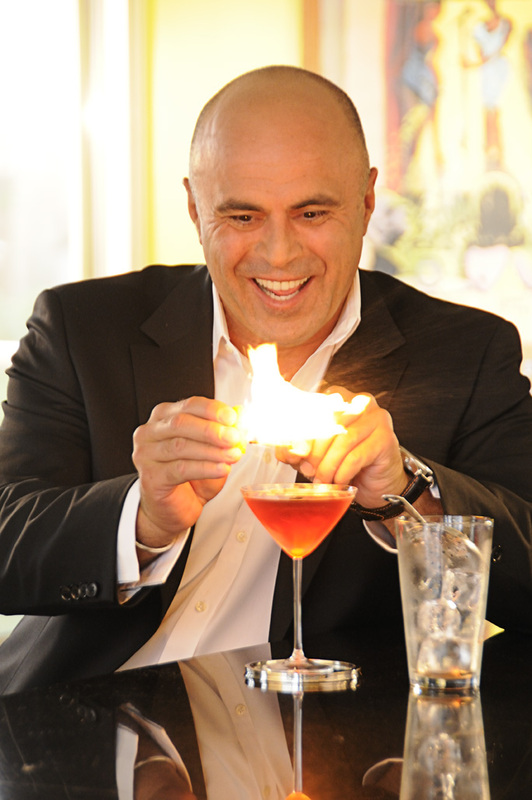 He not only implemented his philosophy of bartending and drink preparation, stressing both quality ingredients and proper technique, but also created several original cocktails for the resorts 22 bars. In 2002, he won the Bacardi Martini World Grand Prix – one of only two Americans to ever win this title. In 2014, Abou-Ganim teamed up with Caesars Palace to develop the cocktail program at The Lobby Bar. There he collaborated on the menu development as well as assisted with training bar staff, stressing both quality ingredients and proper technique. In 2015, he began working with Levy Restaurants to design signature craft cocktails in the lounges and beverage destinations throughout both Oracle Arena in Oakland, and most recently T-Mobile Arena in Las Vegas. Shortly after, James Beard Award-winning Chef Shawn McClain asked Abou-Ganim to spearhead the dual-faceted cocktail program at McClain’s newest social dining concept at Mandalay Bay, Libertine Social, which opened in 2016. As one of the National Ambassadors of the U.S. Bartenders Guild, www.usbg.org, and Associate Member of the Museum of the American Cocktail, www.museumoftheamericancocktail.org, Abou-Ganim continues to educate about the history and lore of cocktails. He also operates his own beverage consulting firm specializing in bar staff training, product education and cocktail development. Keep current with news, appearances and special events at www.modernmixologist.comon Facebook and on Twitter @MdrnMixologist.